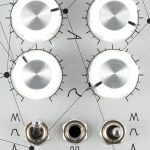 Γωνίες is a dual envelope generator with unprecedented range and precision, thanks to its unique tempo scaling ability. 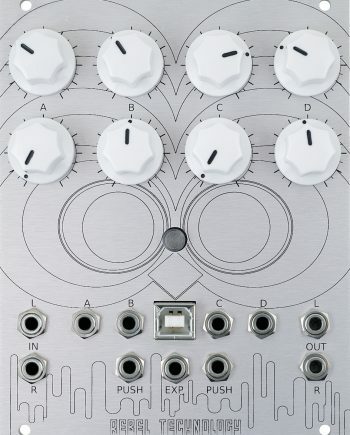 Γωνίες is a dual envelope generator with unprecedented range and precision, thanks to its unique tempo scaling ability. Each envelope has two stages with CV control, adjustable shape, and three modes: trigger, gate and cycle. The attack and release times are tempo dependent and will scale with an optional input clock. In cycle mode the envelopes can be used as variable shape, voltage controlled LFOs. Γωνίες is Greek for Angles, transliterated to English as Gonies. Γωνίες features two independent envelopes on the left and right side of the module. 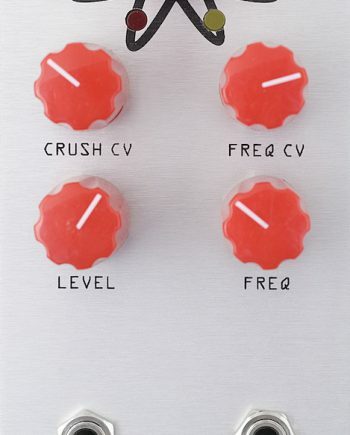 The top knobs control attack: the envelope rise time. 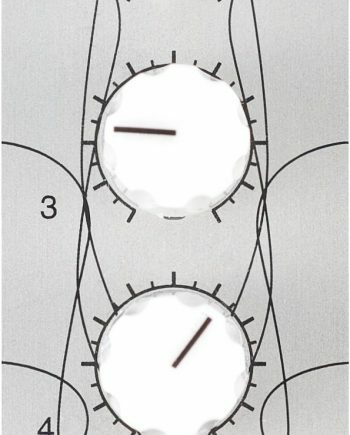 The second knob sets the fall time, or release. Third knob controls the curve, which ranges from logarithmic, to linear in the centre, to exponential at fully clockwise. Adjusting the shape does not affect the attack or release times. The toggle switches set the envelope mode: Trigger mode in the down position, Gate in middle, Cycle in the top position. In Trigger mode the envelope will proceed immediately from the attack phase to the release phase. 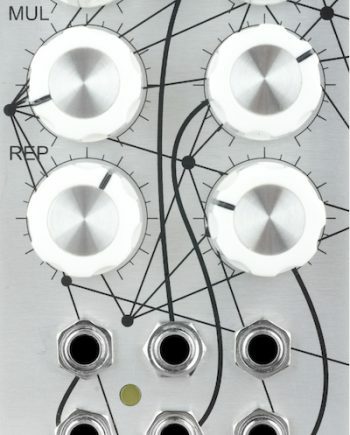 In Gate mode the envelope will stay at maximum output level for the duration of the input trigger signal. In Cycle mode the attack phase will be immediately restarted once the release phase has finished, creating an LFO function. The two envelopes share a master tempo, which is used to calculate the attack and release times. With no clock connected to the tempo input, the tempo defaults to 80 BPM. By providing a regular trigger the envelope times will be adjusted accordingly, so given a 40 BPM clock they will take twice as long, and at 160 BPM they will run twice as fast. Changing the tempo also changes the range of the attack and fall times. The full range is always 8 bars, with one quarter note just slightly before the middle position. At 80 BPM, or with no clock input, this goes from 2 milliseconds at fully counter clockwise, to 260 milliseconds in the middle, to 24 seconds at fully clockwise. The tempo will synchronise to any clock between 0.1 BPM (0.0016Hz) and 1000 BPM (16.66Hz). At slow tempos the attack and release times can reach up to 6 hours (12 hours combined), and at high tempos they can run faster than one millisecond. Note that the clock input doesn’t quantize or synchronise the triggers in any way, it simply scales the attack and release times. If your clock itself is synchronised with your triggers, i.e. clocked by the same master clock, then the envelopes will run in perfect synchronisation with any tempo changes. The envelope will move to the attack phase whenever a trigger is received. In cycling mode, this can be used to add movement and shape. In trigger and gate mode, it can be used to restart the envelope without discontinuities. In gate mode, if the gate is released before the attack phase is complete then the envelope will move to the release phase. In trigger mode, the envelope will always complete both attack and release phases when a trigger is received, regardless of trigger duration. Mix 04 is Open Hardware, published under the Gnu GPL. The schematics and BOM are available on GitHub. Please send your patches to us as pull requests and bug reports as issues on GitHub.